Blockdude is a puzzle game where you need to be able to reach the exit by moving boxes, it’s as simple as that. It is a remake of the Blockman Game from Soleau Software and the TI 83 Blockdude game by Brandon Sterner. There are 23 levels included. 21 Levels from the orginal blockman game and 2 levels created by Willems Davy. 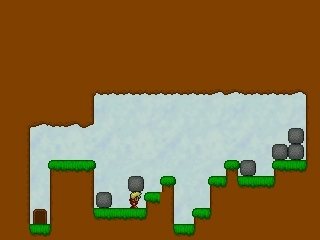 The game has a built in level editor so you can create new levels on your own and release them as levelpacks. You can also play upto 25 of your own ogg/mod music files.And lastly the is skin support.